During the 19th century, most shops were open from 6am or 8am right up to 10pm. This was largely because shopkeepers had to contend with the traditional shopping hours of different classes of society. The upper classes shopped in the morning; the middle classes in the afternoon; and the working classes after work and late into the evenings. Shop assistants were expected to work for the entire period. They were generally not given tea breaks and would have their lunch only when there was a quiet period. 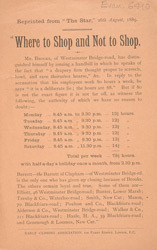 Campaigners such as the authors of this pamphlet wanted to limit shop opening hours so that assistants would only have to work an eight-hour day.